THE FUTURE OF EVERYTHING WE VALUE, FROM OUR ECONOMIC PROSPERITY TO HOW WE GET OUR FOOD AND WATER, TO WHERE WE WORK AND PLAY, IS AT STAKE. OUR CHALLENGE: Exploitative use, ineffective management and climate change jeopardize the health of our state’s iconic forests, diminishing critical wildlife habitat, weakening local economies and threatening access to and the benefits of world class recreation. OUR STRATEGY: Engage the public and invest in protection and restoration in key landscapes to ensure that healthy forests support the wildlife and communities that rely upon them. OUR CHALLENGE: Political gridlock in Washington, D.C., and around the globe has delayed action on climate change while widespread land use changes diminish nature’s ability to mitigate greenhouse gas emissions. In the meantime, the effects of climate change–flooding, fire, ocean acidification, deteriorating forest health—are impacting our state. OUR STRATEGY: Inspire climate action and to demonstrate the power of natural systems to absorb carbon and reduce risks to people. We will do that by transforming public policy. OUR CHALLENGE: Intensive human use, climate change and a fragmented system of water management are straining the health and resilience of our freshwater systems and Puget Sound. These threats to our region’s floodplains are urgent, creating potentially irreversible loss and must be addressed at system scale. OUR STRATEGY: Develop a shared regional approach to nature-based solutions that make Puget Sound water systems more resilient by restoring critical habitat and building community resilience in river valleys in ways where a single conservation intervention can have a positive impact across multiple ecosystem recovery targets. OUR CHALLENGE: Rapidly increasing urbanization threatens Puget Sound with significant challenges, including toxic runoff, while creating a population that is disconnected from nature and natural solutions. OUR STRATEGY: Accelerate the revitalization of urban lands and waters at the bold new pace we need to save the quality of life we all treasure. We are integrating nature back into our cities in strategic ways that produce clean water, livable communities, and plan for growth. The successes we achieve here in Puget Sound in working with conservation organizations, social-justice organizations and urban leaders can serve as a model for the rest of the world. As the region we love continues to grow, there’s not a moment, a talent, or a resource to waste. 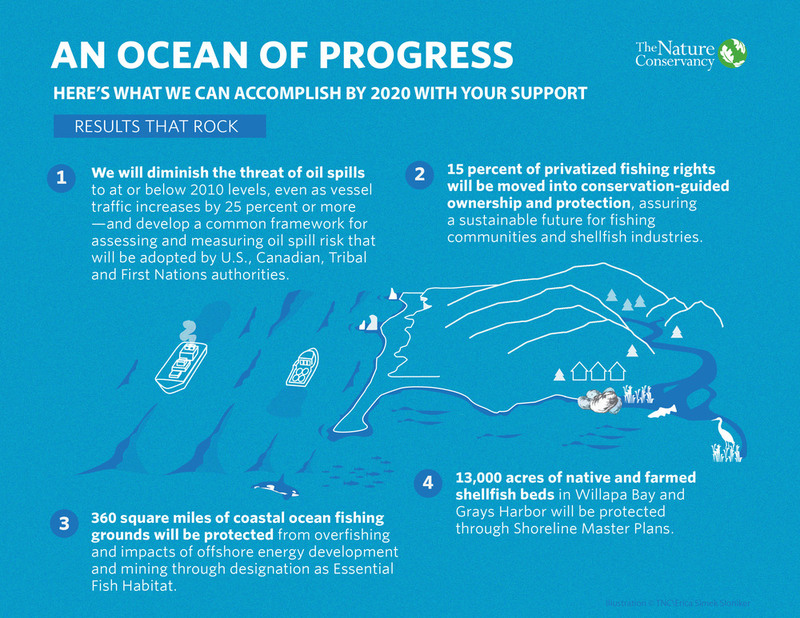 OUR GOAL: Spark a revolution in ocean protection that sustains diverse marine habitats, abundant fisheries, and coastal economies and cultures. Our vision is of thriving nature and thriving communities – a shared future that enables us to prosper at the same time that we care for the lands and waters that sustain us. We need you to make this vision a reality.